Houston Astros manager A.J. Hinch saw two of his own players — Alex Bregman and George Springer — hit solo home runs in the 10th inning against Dodgers pitcher Ross Stripling, whose manager Dave Roberts is captaining the National League squad. The AL now has a 8-5 lead in the 10th, in an inning that looked an awful lot like last year’s World Series, which set a Fall Classic record for home runs. Just when it looked like the American League might win their sixth straight All-Star Game, Reds second baseman Scooter Gennett hit a game-tying home run against Mariners closer Edwin Diaz, locking things up at 5-5 in the ninth inning. That gives us seven home runs in this All-Star Game, setting a record for the midsummer classic. Christian Yelich picked up a run for the NL in the eighth inning, pulling the NL to within 5-3 with yet another home run, this one a solo shot. It tied the All-Star Game record with six total home runs, last done in 1971. All six of those home runs in 1971 were hit by Hall of Famers: Johnny Bench, Hank Aaron, Roberto Clemente, Frank Robinson, Harmon Killebrew, and the one I will always remember, Reggie Jackson off the roof! Mariners shortstop Jean Segura won the American League Final Vote, earning the last roster spot on the AL roster. That decision paid off handsomely in the eighth inning, when Segura slammed a three-run home run to open up the game. We now have a tie game through seven innings, thanks to Rockies shortstop Trevor Story, who took Charlie Morton deep. Four runs so far in this game, with two home runs for each team. With phones allowed in the dugout and on the field, this All-Star Game is the most media-friendly ever. J.D. Martinez even got into the action, asking Manny Machado where he might end up. Mike Trout is the best player in baseball, but his true passion is [checks notes] weather. Fox had some fun with this during the broadcast, and Trout was a willing participant, having some fun with it. In the most screen time for a Willson since Cast Away, Cubs catcher Willson Contreras homered to open the bottom of the third inning, cutting the AL lead to 2-1. Contreras to popular belief, the National League will not be shut out this evening. Mike Trout homered off Jacob deGrom in the third inning to widen the American League’s lead to 2-0. Trout has at least one hit in all six of the All-Star Games he has played in (he was hurt in 2017). He’s 7-for-14 with two homers, two doubles, a triple and three walks in All-Star play. 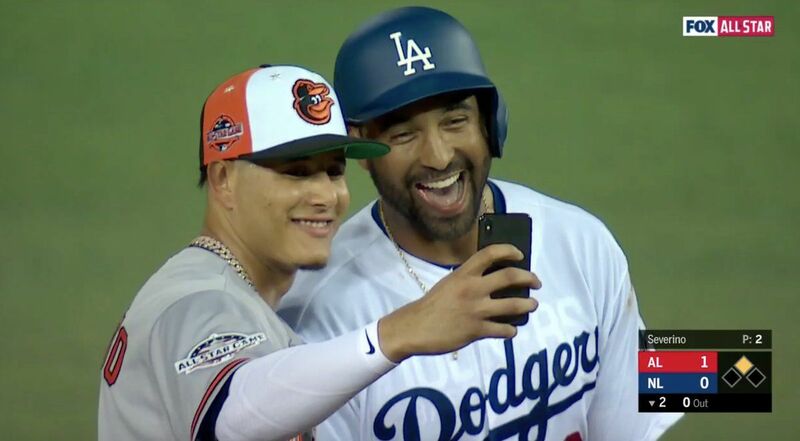 Matt Kemp doubled in the second inning, and when he reached second base he was greeted by current Oriole and rumored-to-be future Dodger teammate Manny Machado. Is it legal to consummate a baseball trade by a selfie? The scoring was opened in the top of the second inning, with Max Scherzer back for a second inning of work. Aaron Judge won last year’s Home Run Derby but didn’t participate in this year’s contest. He was saving them for Tuesday — Judge blasted a home run to left field, putting the American League up 1-0. The AL has won five straight All-Star Games. Max Scherzer pitched a scoreless first inning, working around an eight-pitch walk to Mike Trout and a single by J.D. Martinez. Scherzer was also dealing in the opening frame. MLB introduced 29 Medal of Honor winners on the field prior to the start of the All-Star Game, and a nice moment became even better as all the players converged on them. This exchange in particular was neat!